No one wants a brand-new kitchen with appliance doors that bump into cabinet doors, or an island so close to the wall that it can't be used for dining. Good space planning will help you develop the best layout for your kitchen, so take the time to read this condensed version of the NKBA guidelines. Designed to maximize safety and functionality in home kitchens, the guidelines represent ideal layout solutions to kitchen concerns from storage space to door clearance. Don't fret if budget limitations and the constraints of an existing kitchen require some compromises and tradeoffs: The only rules you must follow are building codes. 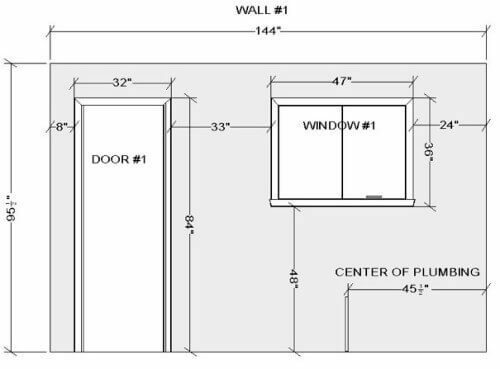 Door/Entry:A doorway should be at least 32 inches wide. Door Interference:No entry door should interfere with appliances, nor should appliance doors interfere with one another. Distance Between Work Centers:In a kitchen with three work centers*, the sum of the distances between them should total no more than 26 feet. No leg of the work triangle should measure less than 4 feet nor more than 9 feet. When the kitchen includes additional work centers, each additional distance should measure no less than 4 feet nor more than 9 feet. No work triangle leg should intersect an island or peninsula by more than 12 inches. Separating Work Centers:A full-height, full-depth, tall obstacle [i.e., a pantry cabinet or refrigerator] should not separate two primary work centers. Work Triangle Traffic:No major traffic patterns should cross through the work triangle. Work Aisle:The width of a work aisle should be at least 42 inches for one cook and at least 48 inches for multiple cooks. Walkway:The width of a walkway should be at least 36 inches. Traffic Clearance at Seating:In a seating area where no traffic passes behind a seated diner, allow 32 inches of clearance from the counter/table edge to any wall or other obstruction behind the seating area. If traffic passes behind the seated diner, allow at least 36 inches to edge past or at least 44 inches to walk past. Seating Clearance:Kitchen seating areas should incorporate at least the following clearances: At 30-inch-high tables/counters, allow a 24-inch-wide by 18-inch-deep knee space for each seated diner. At 36-inch-high counters, allow a 24-inch-wide by 15-inch-deep knee space. At 42-inch-high counters, allow a 24-inch-wide by 12-inch-deep knee space. Cleanup/Prep Sink Placement:If a kitchen has only one sink, locate it adjacent to or across from the cooking surface and refrigerator. Cleanup/Prep Sink Landing Area:Include at least a 24-inch-wide landing area to one side of the sink and at least an18-inch-wide landing area on the other side. Preparation/Work Area:Include a section of continuous countertop at least 36 inches wide and 24 inches deep immediately next to a sink. Dishwasher Placement:Locate nearest edge of the primary dishwasher within 36 inches of the nearest edge of a sink. Provide at least 21 inches of standing space between the edge of the dishwasher and countertop frontage, appliances and/or cabinets placed at a right angle to the dishwasher. Waste Receptacles:Include at least two waste receptacles. Locate one near the sink(s) and a second for recycling in the kitchen or nearby. Auxiliary Sink:At least 3 inches of countertop frontage should be provided on one side of the auxiliary sink and 18 inches on the other side. Refrigerator Landing Area:Include at least 15 inches of landing area on the handle side of the refrigerator or15 inches of landing area on either side of a side-by-side refrigerator or 15 inches of landing area no more than 48 inches across from the front of the refrigerator or 15 inches of landing area above or adjacent to any undercounter refrigeration appliance. Cooking Surface Landing Area:Include a minimum of 12 inches of landing area on one side of a cooking surface and 15 inches on the other side. In an island or peninsula, the countertop should also extended a minimum of 9 inches behind the cooking surface. Cooking Surface Clearance:Allow 24 inches of clearance between the cooking surface and a protected noncombustible surface [e.g., a range hood] above it. At least 30 inches of clearance is required between the cooking surface and an unprotected/combustible surface [e.g., cabinetry] above it. If a microwave hood is used, then the manufacturer's specifications should be followed. Cooking Surface Ventilation:Provide a correctly sized, ducted ventilation system for all cooking surface appliances; the recommended minimum is 150 CFM. Cooking Surface Safety:Do not locate the cooking surface under an operable window. Window treatments above the cooking surface should not use flammable materials. A fire extinguisher should be located near the exit of the kitchen away from cooking equipment. Microwave Oven Placement:The ideal location for the bottom of the microwave is 3 inches below the principle user's shoulder but no more than 54 inches above the floor. 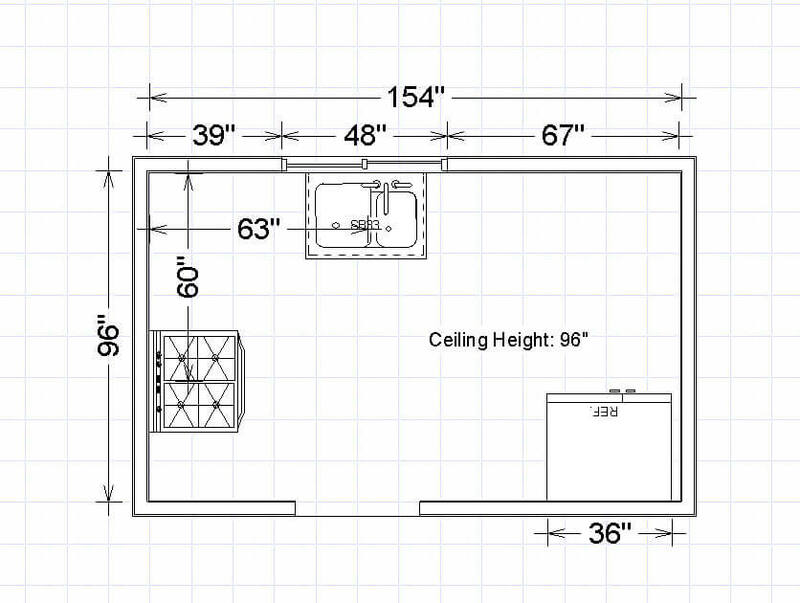 If the microwave is below the countertop the bottom must be at least 15 inches off the finished floor. Microwave Landing Area:Provide at least a 15-inch landing area above, below or adjacent to the handle side of a microwave. Oven Landing Area:Include at least a 15-inch landing area next to or above the oven. At least a 15-inch landing area not more than 48 inches across from the oven is acceptable if the appliance does not open into a walkway. Combining Landing Areas:If two landing areas are adjacent, determine a new minimum by taking the longer of the two landing area requirements and adding 12 inches. Countertop Space:A total of 158 inches of countertop frontage, 24 inches deep, with at least 15 inches of clearance above, is needed to accommodate all uses. Countertop Edges:Specify clipped or round corners rather than sharp edges. Storage:The total shelf/drawer frontage is: 1,400 inches for a small kitchen (150 square feet or less); 1,700 inches for a medium kitchen (151 to 350 square feet); and 2,000 inches for a large kitchen (351 square feet or more). Storage at Cleanup/Prep Sink:Of the total recommended shelf/drawer frontage, the following should be located within 72 inches of the centerline of the main cleanup/prep sink: at least 400 inches for a small kitchen; at least 480 inches for a medium kitchen; and at least 560 inches for a large kitchen. Corner Cabinet Storage:At least one corner cabinet should include a functional storage device. This does not apply if there are no corner cabinets. Electrical Receptacles:GFCI (ground fault circuit interrupter) protection is required on all receptacles servicing countertop surfaces. Lighting:Every work surface should be well-illuminated by appropriate task lighting.